Your number one entertaining crew #AMT_INC in collaboration with Panda Empire presents the second edition of RIPPED RUGGED GLOW PARTY #RRGP on the 5th Of March, 2018 at UDS, Wa Campus inside the Fugitive Night Club at a cool 15cedis. 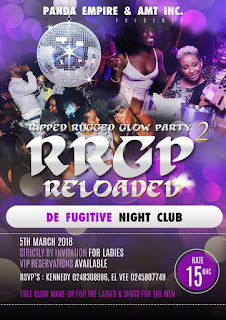 The RIPPED RUGGED GLOW PARTY #RRGP will includes activities like; Snooker, Shishaflex, Red Carpet and photoshoot. Keep the date and don't forget to be part of this history making party.